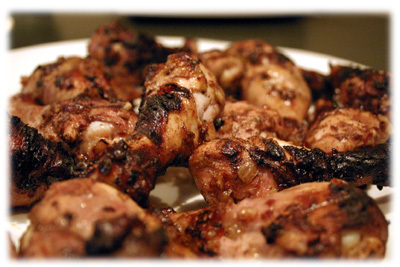 If you're from the Islands or just love to visit then you'll be familiar with the unmistakable flavors of a Jerk Chicken recipe. Whether you're out for a stroll along a beach or wandering through a small village you'll likely encounter someone cooking BBQ Jerk chicken. I also think the jerk marinade recipe is really what makes this famous recipe so good, with that authentic allspice and cinnamon flavor. Any cut works well with this marinade but I always seem to use drumsticks - easy to grill and great at a backyard party - the drumstick comes with it's own built-in handle for eating! And you can control the heat level, just add or decrease the red pepper flakes accordingly. Note: it's best if this chicken is allowed to marinate at least 4 hours but overnight really puts the flavor to it. In a frying pan add the olive oil and bring to medium-high heat. Add the chopped onion, garlic and red pepper flakes. Sautee until the onion is softened. 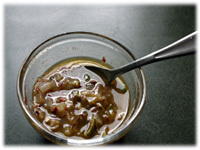 Transfer the onions, garlic and red pepper flakes to a medium glass bowl and add the remainder of the spices, lime rind and juice to the bowl. 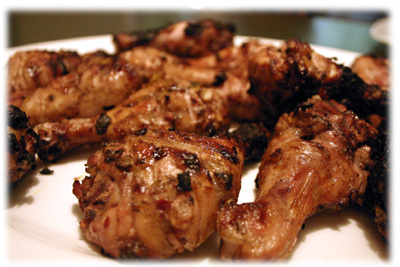 Reserve 1/4 of this jerk marinade recipe to use as a basting sauce on the jerk chicken recipe as it grills. Add the juice of another lime to the reserved mixture. 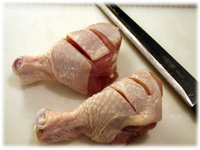 Make a couple diagonal cuts on both sides of the drumstick in the meatiest section. Put the pieces in a resealable plastic bag and add the jerk marinade. 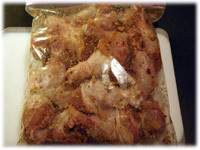 Close the bag and distribute the marinade well so it covers each piece. Place the bag in a glass dish in case the bag leaks and put in the refrigerator at least 4 hours (best if you can leave them overnight). Clean and oil the grates of the BBQ well and prepare for direct heat grilling. Preheat to 400F - 425F. 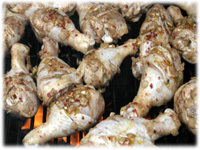 When at temperature place the drumsticks on the grill. Ensure there's spaces between each piece to allow for even heat distribution. 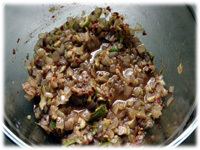 Baste each piece with the reserved jerk marinade recipe and close the lid. After 10 minutes give each piece a little wiggle with your tongs and flip them over. 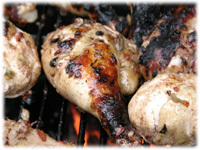 Baste each piece of chicken with more of the reserved jerk marinade recipe and close the lid. After another 10 minutes check on the chicken. If the juices are running clear (and not pink), the skin is browned and crispy and the meat appears to be shrinking back from the bone then remove the drumsticks to a serving tray and cover for 5 - 10 minutes before serving.